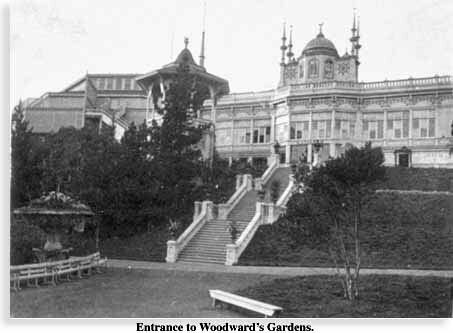 Woodwards Gardens, containing about six acres, are situated on the west side of Mission street, between Thirteenth and Fourteenth. They are reached by means of street cars. The admission fee to the grounds is twenty-five cents, and admits the visitor to all that is to be seen. Once within the high fence, and strolling among the choice trees dotting the grounds, that are entirely screened from the wind, one observes many interesting objects. An extensive Museum, occupying the building, formerly the residence of Mr. R. B. Woodward, the proprietor, fronts the main entrance. This building contains a large and valuable collection of zoological specimens from all parts of the world. Here the naturalist will find abundant material for study, while the mineralogist will discover in an extensive collection of Japanese minerals much that will interest him. Adjoining the Museum is an extended series of Conservatories. In these fairy-like apartments beautiful exotics greet the visitor with sweet perfume, while in one room a wilderness of ferns challenges observation. They are of numerous varieties and from widely separated localities. Connected with the largest Conservatory, through which the visitor enters, is a small but select Art Gallery, reached through a vestibule, which is frescoed in imitation of Pompeian art. In this ante-room the numismatist will find objects of great interest. Near the Conservatories are two large ponds, with rock work at the center of each. Here numerous seals and sea lions live. Here is an opportunity for near observation of their strange habits. Various water fowl live along a small stream running through the grounds. A feature of great interest to the visitor is the Marine Aquarium. This is not as complete as a few of the more magnificent European ones, but, nevertheless, is noted as being, at the present time, the largest aquarium in this country. Several tanks contain the inhabitants of salt and fresh water respectively, and give rare opportunities to watch the antics of those little-known members of the animal kingdom. A few tanks contain handsome brook trout, and as the visitor watches these speckled beauties securely swimming among the rock-work, a thrill of excitement recalls the pleasures which the angler feels by the still pool in the woods where tall pines shut out the sunlight. Over the Aquarium is a hall, the walls of which are covered with large-sized photographs of California scenery, affording much pleasure either to him who has seen the original landscapes or to him who has those delights yet in anticipation. A tunnel under Fourteenth street conducts us to the Zoological Gardens. Here are the greater number of the animals. In this enclosure are a large bear pit and yards for camels, deer, buffaloes and other similar quadrupeds. Many varieties of domestic fowls form interesting groups, while the heterogeneous happy families and the out-door gymnasium are sources of delight to the younger visitors. Re-entering the main grounds, we ascend by a winding path, along which numerous rustic seats are placed, and, on the summit of a hill, find a pavilion one hundred and fifty feet long, one hundred and thirty feet wide, and fifty feet high. It will seat six thousand persons, while in the center of the hall a smooth, open floor, one hundred and ten by ninety feet, is the scene of numerous acrobatic feats, as well as an arena for dances and skating tournaments. A part of this building is devoted to the purposes of a restaurant, while tables among the native trees on the hilly slopes offer accommodation to those who prefer to bring lunch with them. Altogether Woodwards Gardens afford much pleasure and profit to one who spends even a short time there. They also are a credit to the private citizen whose wealth has constructed them. Across the street from the main entrance to Woodwards Gardens, Messrs. Miller, Sievers Co. have opened an Exotic Garden. Admission to these very extensive greenhouses is free, and the admirer of plants will gladly avail himself of this opportunity to see the many rare and beautiful specimens of the vegetable kingdom growing there. Numerous nurseries of plants in different parts of the city will interest the horticulturist, and will repay him for the time employed in visiting them. IN: California Notes, By Charles B. Turrill. San Francisco, E. Bosqui & Co., 1876.